This is, by far, one of the best comforters I’ve ever purchased. It’s easy to wash and is so comfortable. It’s not overly soft or rough and the colors are so vibrant. I love this set. Imbue your decor with the luxurious sophistication of this comforter and sheet set. Featuring an intricate medallion pattern in vibrant shades of teal, green, blue, and white, the set enhances any space with elegance. The soft fabric offers comfort and warmth, and the set is machine washable for effortless cleaning. My husband and I have a king sized bed, but our mattress is extra thick, so king sheets and comforters don't fit. I went out on a limb and purchased a California King set. Thankfully it fit perfectly. The sheets are thin and cool, but don't feel cheap. The comforter is relatively thick and heavy, but it feels luxurious and expensive! My favorite thing about it is the boldness of the colors in the comforter set. These colors are very pigmented and bright! Everything about this set is fantastic. The pockets are deep enough to go over the edge of my 12 inch mattress so the fitted sheet never comes undone. The blanket is so soft and the pillowcases are the same. The print is exactly how the picture shows it. You will not be disappointed. Love this bed in a bag. It looks great in my room adding a lot of pizzazz. I gave it a 4 because I feel it is a tad small and needs a couple more inches to cover the sides well. We've had this set for a few months now, and it's really quite excellent. Colors are bright and true to the screen, and it matches the paint we already have in our bedroom well. The sheets that come with the set are 100% cotton and deep enough for our 15 inch mattress -- this was a VERY welcome surprise as we weren't counting on much with the sheets.The comforter washes well and is holding up. Overall, we're quite happy with this set. I bought this comforter less than a year ago (June 2015). I've always had down comforters with duvet covers, so this was my first comforter purchase. It took my husband and I SO long to decide on one and of course we choose a dud. A lot of times people post blissful reviews soon after receiving items, but I am curious to know what people think who have had this comforter for a while.. because this is what we found: Pros: -The design and colors look good and mask dog hair well (we have two dogs that sleep in bed with us). -Good price. Cons: -Low quality. Lasted us less than a year. [my $30 ikea goose feather duvet lasted me 5+ years]. -The material is thin and ripped and tore easily. -Has a horrible Polyester feel. Even though description says "100% cotton outside" all I could feel was static polyester, which I hate and which only got worse over time. [the cotton part is one of the major reasons why I purchased this comforter, so I was sorely disappointed by this] I'm not a picky person, but I don't think it's worth spending money on low quality things that won't last and that don't feel good. I will not be purchasing a comforter like this again. Good quality fabric. Nice and soft and vibrant colors. Very happy with this product! Colors are true to picture. I ordered Cal. 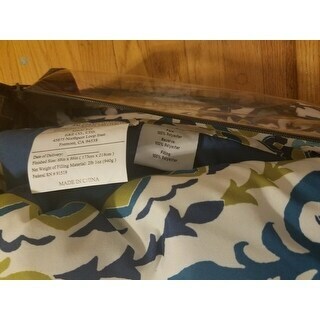 King bed set and sheets......and received twin sheets along with my Cal. King comforter. The company does Not have partial returns, but Overstock was kind enough to give me customer credit of $20 to purchase a cal. King fitted sheet. Overall the comfter is light and soft but would have spent my $100+ on something else if I knew i would not be able to have the sheets included. Be aware! I bought this set at first b/c my husband wanted the bedroom to be blue. 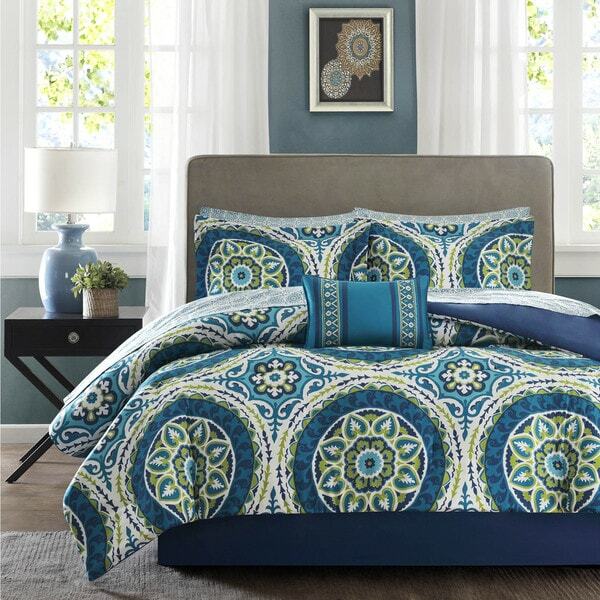 This comforter set is blue/teal and lime green in it. It is more soft than I thought it would be. The picture of the accessory pillow doesn't do it justice. It is far more gorgeous. The sheets are pretty but not a high grade. Otherwise, I'd give it a 5 star rating. Everything except the small pillow is machine washable and seems to hold up so far. The one thing, however, is the warning that they are not to be ironed. I'm not entirely sure why not, but there are times I'd like to iron the pillowcases since they wrinkle. Loved this set beautiful colors. Just as expected. This product looked exactly as pictured. It is of reasonable quality especially for the price - a real bargain. comforter is college quality, pretty thin. The colors are true. The sheets crinkle on the edges after washing which I do not like. The accent pillow is great. Very pretty. Very disappointed.Why does the Q&A section and also the description of the item say the comforter is 100% cotton on the outside when it clearly is not. Planning to return this but now, am questioning the validity of information provided here on the Overstock website. Would be interested to see if others who responded did not see the label clearly. I love the colors on this set and they're still vibrant after a year of use in our camping trailer. The comforter is warm enough and still fluffy. This was a gift for my mom and dad. They loved it! This is a beautiful comforter it's a little thin but washes and wears well on my bed. I was somewhat hesitant when I bought this comforter set. I had painted is my headboard wall a bright blue and didn't want the Blues in the spread to clash. When they came I couldn't wait to put them on and believe it or not the blue is perfect it's not Navy but it's not too bright just perfect. The quality of the material is very good and the size fits wonderfully. I'm very happy with my comforter set. only problem is the dog chewed a hole in it 3 days after so looks like I'll be ordering another from you.I know the quality will be just as good. The delivery was fantastic it came so much sooner than I expected. I'm very happy with all that I order from Overstock thank you guys. The comforter is too light and staticky. Colors looked just as pictured. Love this! It's bright and colorful, and so soft. I ordered the shower curtain and made a valance to match. I really like the look of this set and it has held up well after two years is use. I was looking to match pro dime to colors in the art in the room and this unique set fit the bill perfectly. This is a beautiful set. The comforter is thick and soft, and the colors are bright and warm. The sheets are a nice quality as well. This set was a great buy. The best part is the fact that my teenager loves it! "I bought this set. Is there a way to also buy just the sheets and pillow-cases to have extra matching linens?" "Does this set come with matching valances?" "Will the fitted sheet fit over a deeper mattress? Or is it a standard depth?" I have a pillow top mattress and fitted sheet fits fine. It is not standard depth. I have a sleep number bed approx 9" depth. Fitted sheet pocket measures 12" on this set. Fits great. It will fit deeper mattresses. However, just an FYI, the sheets aren't very soft. But, we love the look of the entire ensemble. "What material is the comforter made of?" Outside is cotton and filled with polyester. I've washed several times and washes very well. "What is the depth of the fitted sheet? I have a very thick mattress. Thanks." I would estimate 10-12". I have a mattress with a topper and I have a feather mattress topper on top of that. It fits perfectly. Very easy to put back on and it stays put. It doesn't come loose. I hope this helps. The bottom fitted sheet will cover a deep mattress. "I leave in Miami and even with air conditioning at 70 degrees at night I get hot, is this comforter thin or thick? is it 100 % cotton? Are the edges sawn all around so the filling does not get bulge when I wash it?" This is for all season comforter with 1.25 thickness. It may not be ideal for Miami weather since it is humid and hot there. No, the comforter has bar tacking all over to protect filling from shifting. It is polyester fabric, not cotton. I would suggest coverlet which is a thin quilted coverlet ideal for summer season. Our quilted coverlet has polyester face fabric with cotton filling. This pattern has coverlet available. "What is difference between King and California King ?!" I purchased a queen size comforter. The answer to your question is a King size is 76" wide by 80" long. A California King is 72" wide by 84" long. So the King size is wider in width and shorter in length than the California king. I love this comforter!!! It's warm and soft, but it's not too heavy. A king size which is also known as eastern king to some people is going to be the widest mattress at 76 inches wide by 80 inches long. A california king size is going to be 72 inches wide by 84 long making it the longest possible mattress, but it is 4 inches narrower.